A dazzling triumph from the bestselling author of The Virgin Suicides--the astonishing tale of a gene that passes down through three generations of a Greek-American family and flowers in the body of a teenage girl.In the spring of 1974, Calliope Stephanides, a student at a girls' school in Grosse Pointe, finds herself drawn to a chain-smoking, strawberry blond clasmate with a gift for acting. The passion that furtively develops between them--along with Callie's failure to develop--leads Callie to suspect that she is not like other girls. In fact, she is not really a girl at all.The explanation for this shocking state of affairs takes us out of suburbia- back before the Detroit race riots of 1967, before the rise of the Motor City and Prohibition, to 1922, when the Turks sacked Smyrna and Callie's grandparents fled for their lives. Jeffrey Kent Eugenides is an American Pulitzer Prize-winning novelist and short story writer of Greek and Irish extraction. Eugenides was born in Detroit, Michigan, of Greek and Irish descent. He attended Grosse Pointe's private University Liggett School. He took his undergraduate degree at Brown University, graduating in 1983. He later earned an M.A. in Creative Writing from Stanford University. In 1986 he received the Academy of Motion Picture Arts and Sciences Nicholl Fellowship for his story "Here Comes Winston, Full of the Holy Spirit". His 1993 novel, The Virgin Suicides, gained mainstream interest with the 1999 film adaptation directed by Sofia Coppola. The novel was reissued in 2009. Eugenides is reluctant to appear in public or disclose details about his private life, except through Michigan-area book signings in which he details the influence of Detroit and his high-school experiences on his writings. He has said that he has been haunted by the decline of Detroit. Jeffrey Eugenides lives in Princeton, New Jersey with his wife, the photographer and sculptor Karen Yamauchi, and their daughter. 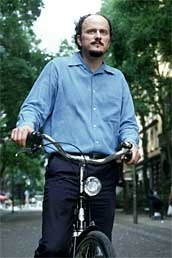 In the fall of 2007, Eugenides joined the faculty of Princeton University's Program in Creative Writing. His 2002 novel, Middlesex, won the Pulitzer Prize for fiction and the Ambassador Book Award. Part of it was set in Berlin, Germany, where Eugenides lived from 1999 to 2004, but it was chiefly concerned with the Greek-American immigrant experience in the United States, against the rise and fall of Detroit. It explores the experience of the intersexed in the USA. Eugenides has also published short stories. Eugenides is the editor of the collection of short stories titled My Mistress's Sparrow is Dead. The proceeds of the collection go to the writing center 826 Chicago, established to encourage young people's writing.